Murs and Guerilla Union announced additional performers confirmed to appear at the seventh installment of the PAID DUES INDEPENDENT HIP HOP FESTIVAL today. 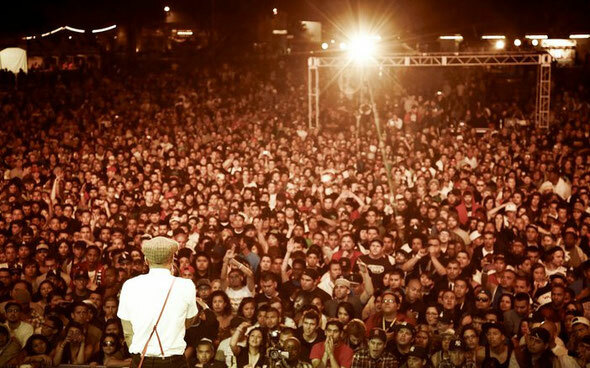 Line-up additions included Living Legends, Hieroglyphics, Kendrick Lamar, DJ Quik, Psycho Realm and Dilated Peoples. Also set to join previously announced headliners Wu-Tang Clan and Odd Future is Dipset (Cam’ron + Jim Jones + Juelz Santana + Freeky Zekey), who will be performing together at Paid Dues for their first ever West Coast performance. Look for additional performers to be announced soon. Presented by independent hip hop pioneer MURS (Living Legends) in association with Guerilla Union (Rock The Bells, Cypress Hill SmokeOut), the PAID DUES INDEPENDENT HIP HOP FESTIVAL will take place on Saturday, April 7, 2012 at the NOS Events Center in San Bernardino, CA. The festival is an all-day, all-ages event with multiple stages highlighting the most eminent and flourishing independent artists in hip hop. 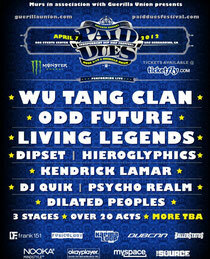 Tickets for the Paid Dues Independent Hip Hop Festival are available now via www.ticketfly.com. Guerilla Union advises fans to sign up for the official mailing list on www.paidduesfestival.com to receive the most up-to-date festival information and new announcements.